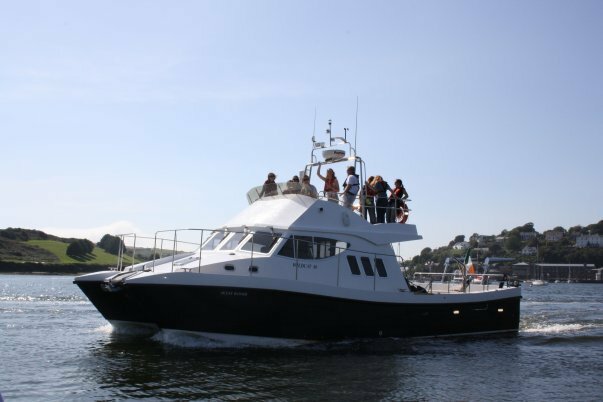 The Ocean Ranger was purpose built in 2009 by Safehaven Marine, Cobh, Co. Cork, and is one of their finest crafts to date available for boat hire. This boat has gone through rigorous sea trials to test its sea capability and has proved to be one of the safest boats on the market today for hire. The Ocean Ranger is equipped with twin 575 Volvo engines allowing her a fast 32 knot speed and a comfortable cruising speed of 20 knots. 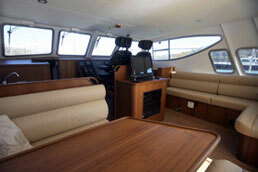 On board, there is a computer system with Internet access, printer, scanner, fax and a satellite phone to ensure that you are contactable wherever the sea takes you. Our spacious cabin offers a comfortable seating area for twelve people with full heating to keep you warm on winter cruises. There is an onboard toilet for your convenience. 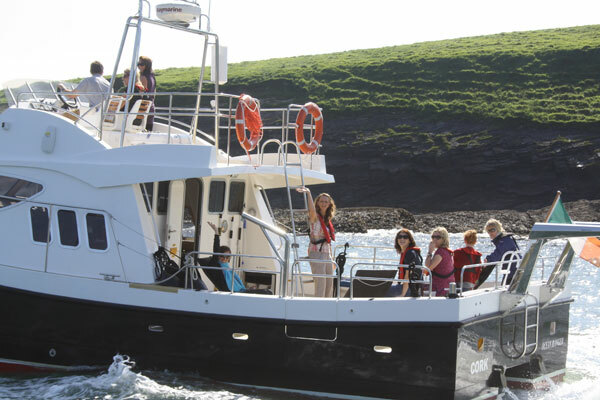 Outside, the vast deck area allows for a comfortable twenty people, enabling you to sit and enjoy the wonderful scenery or you may wish to step up to the fly bridge for a panoramic view of the exquisite coastline on your boat hire trip. Fancy a dip in the fresh sea water? A warm shower and fresh towels will greet you back on board. Also on board, we carry a 3.5 metre RIB tender, which can quickly transport you to the many secluded bays, inlets and adorable beaches which cannot be accessed by larger boats. The Ocean Ranger carries a P5 passenger boat licence and as such had to pass stringent safety procedures to ensure your safety on board our vessel. These safety tests began prior to the boats building and continued to be reviewed and approved throughout construction as the vessel was continually inspected by a marine safety officer from the Department of the Marine. To further ensure your safety, the Ocean Ranger is fitted out with a full array of the latest high spec safety and navigational equipment with an auxiliary back up system. Take a closer look at the performance safety tests by the builders of this vessel. 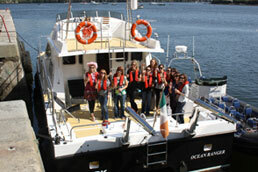 Personal Safety – We insist that all passengers wear a lifejacket at all times, whilst onboard the boat. These are slim and comfortable to wear. To further ensure your safety we are equipped with life rafts and personal floatation devices, to be used in the event of an emergency.